It’s the size of the fight in the dog, right Snoopy? So, Snoopy – relax about the weight – its the weight of your awesomeness and intellect that count . If its not apparent by now, I’m a fan of comics. Two of my favorite characters in comics would be Batman and Snoopy (of Peanuts fame). So, when I read this week’s Comic Book Urban Legends Revealed (its a weekly series on CBR’s Comics Should be Good blog), I was extremely delighted to see that there was a short Batman comic written in 1981 which homaged Snoopy’s great American novel. Why pay attention? Because then check out the following Batman comic. See anything familiar in the text? I was saddened to discover, upon checking my favorite RSS reader that Sheldon Dorf, founder of the San Diego Comic Con which I have grown fond of passed away today (Yahoo News link). SAN DIEGO – Sheldon Dorf, who founded the world famous Comic-Con International comic book convention, has died. He was 76. A longtime friend, Greg Koudoulian, says the Ocean Beach resident died at a San Diego hospital on Tuesday from kidney failure. He had diabetes and had been hospitalized for about a year. Dorf, a freelance artist and comic strip letterer, founded Comic-Con in San Diego in 1970 after moving from Detroit. Today, the convention draws 125,000 fans a year and is a major gathering for comic book fans, artists, writers and movie stars. Koudoulian says Dorf was friends with comic greats such as Marvel artist Jack Kirby and “Peanuts” creator Charles Schulz. He says Dorf was also instrumental in helping budding artists find audiences. This was, of course, immediately followed by some comically ingenious sentence which made it immediately obvious that Snoopy, although quite creative (and talented! how many dogs do you know who can use a typewriter?) would probably never realize his dream of being a published beagle. 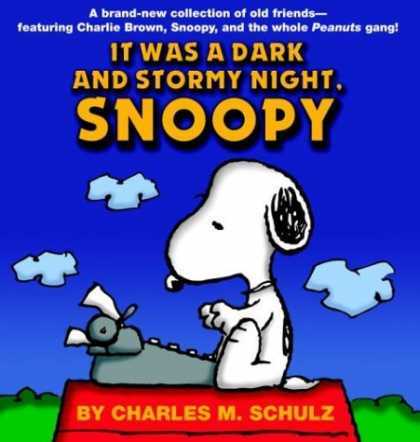 Well, Snoopy, you shouldn’t give up, because bizarre story settings actually do get published! Popular mystery author Michael Connelly not only convinced a publisher that he could write a mystery novel set in a data center (about a killer who actually works in a data center), but convinced enough people to read it that it’s now ranked #3 on the New York Times’ Best Seller list (at least as of June 18th, 2009). Data Center Knowedge: What led you to choose a colocation center as the workplace for Wesley Carver? Michael Connelly: [My researcher] sent me a link to a video tour of a colocation center. I was impressed by all the security and hardware, how the center was located underground and how it was protected from forces of nature as well as electronic intrusion. It was a fortress and these sort of things always interest me because it always comes down to people, who you have inside the fortress is the most important thing. Interestingly enough (although I haven’t read it yet), the novel relies on a few real-life technical features in many data centers including cutting edge fire suppression systems, VESDA smoke detection systems, and man traps. Very impressive, considering how few people know what goes on in data centers (which is a shame as data centers are a driving force in the web/computing space, and are massive contributors to jobs in under-developed areas and local energy concerns). To the uninitiated who don’t realize how bizarre and amazing data centers can be, check out this video of a data center in Stockholm built in what looks like a supervillain’s fortified hideout. As it was built in the Cold War, it is even said to be able to withstand a direct nuclear assault! Now, can we make the next James Bond movie in a Google data center?